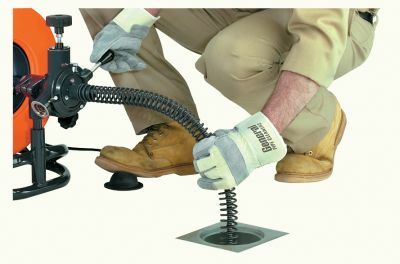 The Sewerooter T-3™ combines large capacity with great portability. You can clear most 2″ to 4″ inside drain lines up to 100 feet long. 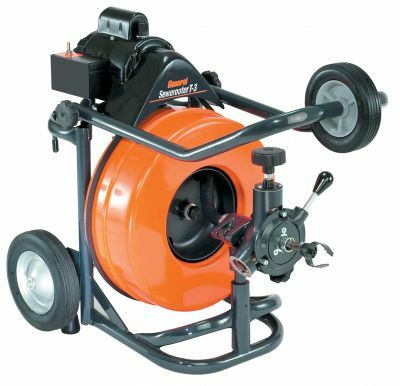 Feed the cable easily into and out of the drain line with a smooth-operating variable speed power cable feed. The machine rolls on big 10″ wheels, has a tough but light weight tubular frame, and a tall folding handle with a truck loading wheel that makes it easy to move around. 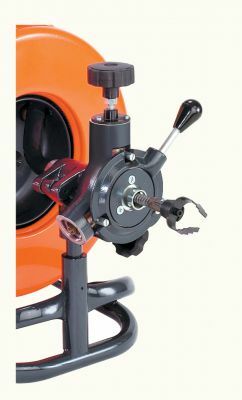 A passive wheel brake holds machine securely on the job. Other important features include a quickly removable drum, and a 1/3 hp motor with capacitor. Like all General’s floor models, the Sewerooter T-3 offers you the safety of an in-line ground fault circuit interrupter, pneumatic foot pedal, and reverse switch with an “off” position. Clears 2″ to 4″ inside drain lines. Big 10” wheels for easy transport, and folding handle for compact storage. Variable speed Power Cable Feed drives and retrieves cable. 1/3 hp capacitor motor with thermal overload protection. The Sewerooter T-3’s power cable feed is a real labor saver. It enables you to vary feeding speed in and out of a line more easily than you could manually and also assist you better when working through tough stoppages. In addition, you can reverse it instantly if you hit an obstruction. The power cable feed drives 1/2” and 3/8” cables. Greatly increases the efficiency of Power Cable Feed by reducing cable whipping and drag. In addition, when it’s difficult to get the machine close the drain opening, a Cable Guide Tube (Cat # T3-GT) and Guide Tube Extensions (Cat # GTE) can literally take you out of the hole. Guide Tube is about 30” long and 1” in diameter. Five foot extensions are made of rigid conduit with a flexible spring end. 61 lbs. (28 kg) less cable. 37″; 25″ with handle folded down. Equipped with inner drum and distributor tube to prevent cable tangling under load. Cable can be driven or retracted from line while cable is rotating. Quickly removable from frame. 100 ft. (30 m) of 1/2″ (12.7 mm) Flexicore wire rope center cable. Use 1/2″ cable for 3 – 4″ lines; 3/8″ cable for 2 – 3″ lines. 1/3 hp heavy duty, capacitor-type with reverse. 10″ semi-pneumatic tires with oilite bronze bushings. Brake locks wheels during operation. 20 foot 3-wire. in-line ground fault circuit interrupter. Feeds and retracts cable at variable speed by moving control handle up or down. Adds safety when you can’t get machine close to drain opening. 5 ft. extension attaches to cable guide tube. 13″ Flexible Leader, Arrow Head, 1-1/2″ U-Cutter, 2″ Side Cutter Blade, 3″ Side Cutter Blade, 4″ Side Cutter Blade, 3″ Rotary Saw Blade, and Small Retrieving Tool. 1/2″ diameter for 3 – 4″ lines (not for roots). 3/8″ diameter for 2 – 3″ lines.